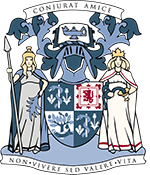 Between 10am and 4pm on Saturday 20th September 2014 the College will be taking part in Glasgow Doors Open Day, as we invite members of the public to come and explore our building and collections. Visitors are welcome to browse the College’s public rooms at their leisure, and wander through the four 19th century houses that make up the College building. On display we will have the College’s fine collection of portraits and contemporary art, as well as a selection of treasures from our library, archive and museum collections, and the ever popular Birds of America by J.J. Audubon will be on display in the Library Reading Room. 2014 marks the 500th anniversary of the birth of Andreas Vesalius, the 16th century anatomist hailed today as the father of modern anatomy. 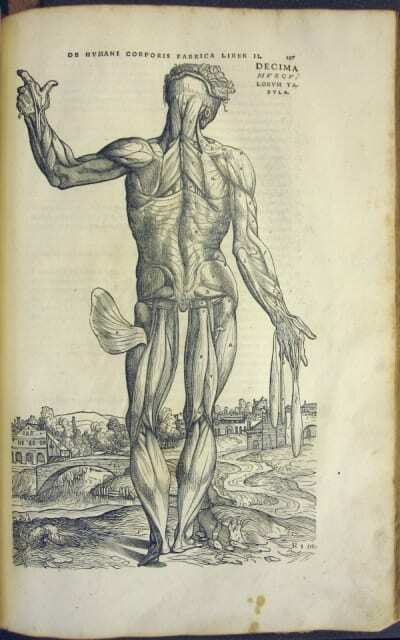 To celebrate this quincentenary we will be exhibiting a very special item from the College’s rare book collection: our first edition copy of Vesalius’ groundbreaking 1543 work, De Humani Corporis Fabrica (On the Fabric of the Human Body). Access to this book is normally restricted, so this is an ideal opportunity to view the famous ‘muscle men’ illustrations and the beautiful woodcuts that helped to secure the book’s enduring legacy as both an anatomical and artistic work. The Vesalius exhibition will be interactive, with a touch-screen allowing visitors to browse through a virtual version of the book. This digital facsimile enables the user to examine the woodcuts in fine detail, and to find out more about the life of Andreas Vesalius and the work that led to the publication of his magnum opus. We have also recently produced a video tour of the College, presented by our Honorary Librarian, and this will be playing in the Maurice Bloch Lecture Theatre. Staff and Senior Fellows of the College will be on hand in every room throughout the day to assist visitors and answer any questions about the College’s history and its role in the teaching, examination and practice of medicine and surgery today. Doors Open Day is perhaps a misnomer, as the event actually stretches out over a full week in venues all around Glasgow and includes a selection of talks and guided walks as well as the usual open buildings. On Tuesday 16th September the College will host a Doors Open talk entitled Heritage Led Regeneration: Investing in the Fabric of Local Communities. This talk offers a behind the scenes look at two projects that invested in Glasgow’s historic built environment in the name of social and economic regeneration. It will feature discussion by the project managers behind the recent Townscape Heritage Initiatives at Govan and Parkhead Cross. The talk begins at 6.30pm in the Maurice Bloch Lecture Theatre, and is free to attend. More information at http://rcp.sg/doorstalk. We hope to see you in College during Doors Open Day. There is a packed programme this year, so be sure to visit the Glasgow Doors Open website to check opening times and plan all your visits!